Some time ago I sent out a request to the quilters of Devon asking for 12 single bed quilts for a new childrens home being built in Provadia, Bulgaria. An old primary school building was saved from demolition and my son went over with a team of volunteers from Okehampton who fitted new windows in the whole building. The main orphanage was bulging at the seams and so extra space was desperately needed. Because Bulgaria is now a member of the EU rules must be followed and so the new home was planned around three two bedroom units with two beds in each room and with each unit having a house mother, hence the 12 quilts needed. 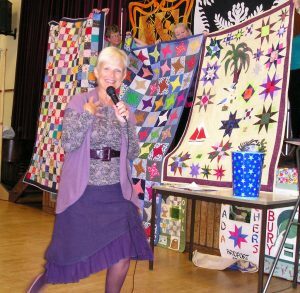 The quilters of Devon did not let me down and on 3rd September we held a coffee morning/bring and buy sale in Okehampton to raise money towards the transportation costs of getting the quilts to their destination. On show were 15 beautiful quilts, which means the house mothers will get one too. We had a wonderful morning with lots of people attending and raised £300. Peoples generosity is heart warming. Because of the commitment of the team from Okehampton the Provadia council decided to get involved and repaired the foundations of the building and put on a new roof. This in turn came to the notice of the government who have now become involved and plans are in hand to extend the building to incorporate a unit for disabled children and a work/living unit for the 18 year olds as they leave care. From tiny acorns mighty oaks do grow. Thank you to everyone who helped in any way making this happen.